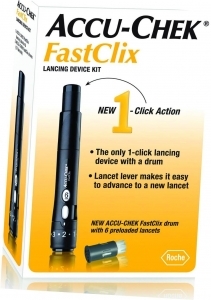 The Accu-Chek FastClix lancing device is the only 1-click lancing device with a drum of 6 preloaded lancets. With 11 depth settings for maximum comfort, and minimal side-to-side motion for less skin tearing, testing is made easier. With 11 depth settings on the comfort dial you can adjust the lancet depth to match your skin type and obtain just enough blood to provide an accurate test. Insert an Accu-Chek FastClix lancet drum into the device. Use the Comfort Dial to adjust penetration depth. Place the device firmly against the skin. To prime and release the lancet, simply press down the plunger like a pen. Your Accu-Chek FastClix lancing device uses a special gray alternate site testing (AST) cap designed for testing on other areas of the body instead of the fingertip. To obtain an AST cap, please call Accu-Chek Customer Care Service Center at 1-800-858-8072. Note: Do not use the gray AST cap when testing at the fingertip. Use the gray cap instead of the black plastic cap. Press the opening of the gray cap firmly against a fleshy area of the non-fingertip site. After pressing down the plunger like a pen, remove the lancing device from the site. Remove the AST cap from the lancing device and, with the lancet hole over the site, press the AST cap against the site until you have a sufficiently-sized drop of blood. Please read the full instructions for use of the lancing device. For use by an individual self-testing person only. Must not be used on more than one person owing to the risk of infection.